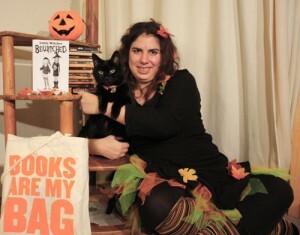 Welcome to my Halloween blog party! Come in… have a seat… don’t mind the cobwebs – they’re just for decoration, would you like some pumpkin pie? Or a glass of pumpkin-spiced punch? It’s all virtual but tasty, I promise! That black cat crossing your path is Shadow. Her costume is the cat burglar from Little Witches – convincing, right? I’m dressed as an Autumn Witch. Today the Little Witches officially launch and just for Halloween there’s a 70% discount on the brand new eBook. That’s £1.53 from Amazon UK or $2.99 from Amazon US. For that price you get five stories about Dulcie and Verity, their friends and their adventures. There’s also cover artwork drawn by Dom and some smashing pumpkins by Sara. 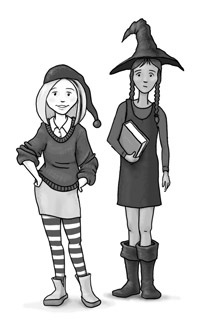 Check out the Little Witches book page for more about the book. 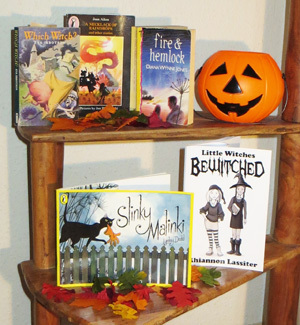 The Little Witches have been celebrating Halloween by trick-or-treating around the internet and visiting various book world blogs and websites to say hello. They arrived early at the home of the Book Witch and got a generous review, but they’ll be back again today for an author profile piece. They moseyed down the internet to Girls Heart Books where they met Jo Cotteril and and added another lavish review to their loot bags. Loot bags bulging, they knocked on the door of Serendipity reviews and found KM Lockwood answering the door, she praised their self reliance while handing over another book review. Next on the trick-or-treat trip was Nicola Morgan’s blog showing off in a piece about being my first self-published book. Finally they arrived at Mary Hoffman’s blog where they were greeted with open arms because Mary is, of course, my mother – and has a warm welcome for all little witches and their friends. Update: The Witches caught Frances Hardinge on her way out the door, black coat flapping, black hat clamped to her head, but she wished us a Happy Halloween as she went flying away. Now they’re back here for their own Halloween party! Keep the pumpkin punch flowing, there’ll be more Halloween fun throughout the day and night on this blog post. Competitions will be announced soon!. Update 10.30 Let the games begin: The first visitors are here – Mary brought delicious pumpkin soup and I will share my share of Sara’s pumpkin toaster pockets. Shadow is ensconced on my lap and shows not signs of moving ever. It must be time for the first competition. This is the costume contest. To enter post a photo or a link to one in the comments. All ages eligible but the photo must be of yourself (not just harvested from the web) and you must be dressed as a witch, a ghost or a cat. Grown-ups, you can post on behalf of your little witches, ghostlings and kittens. The prize is a physical copy of Little witches Bewitched. The proof arrived yesterday, you can see it in the photo of me at the top of this post and on the updated Little Witches book page (where you can also see me dressed as BatGirl), and today I am offering 3 copies as prizes. You’ll have to wait a little bit for the prize because they won’t be available until early December. But I will sign them to the winner – or to the person of their choice if they want to give the book away as a present. The contest is open until 2 November, All Souls Day, (or Bexy’s Birthday as we call it in my family) to give you time to post pictures from Halloween parties on Saturday. But you can get posting now and any pictures from previous years are eligible as long as you’re the one in them. So get posting, people. Let’s see those Halloween costumes. How about Fire and Hemlock? One of Diana Wynne Jones’ best works. 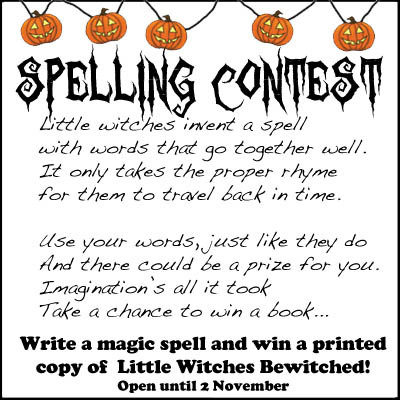 Update 15.00 Spelling Contest: It’s now Hallowafternoon and time for the second contest. I’m beginning to think I should have had a recipe contest and asked people to send me their entries for judging. Too late now, unfortunately. The second contest is the SPELLING CONTEST, no – not that sort of spelling. To win this contest post a spell in poem form. This contest has a 2 November deadline as well (All Bexes Day) so you have time to create your composition. It has to be your own work – although grown ups can post on behalf of children. A simple thing we need to fix. To the year one six oh six. 18.00 Pumpkin contest Welcome to the new arrivals at the blog party. It’s now dark outside in Oxford and time for trick-or-treaters to trickle down the road. As I was writing this a female devil and a male Scream arrived and I distributed congratulations and celebrations. In a minute I’m going to make banana milkshakes (versions with rum for grownups) that’s not very Halloweeny, I know. But delicious, none-the-less. Next year I’ll try and have a pumpkin cocktail. This contest is for the best pumpkin carving. 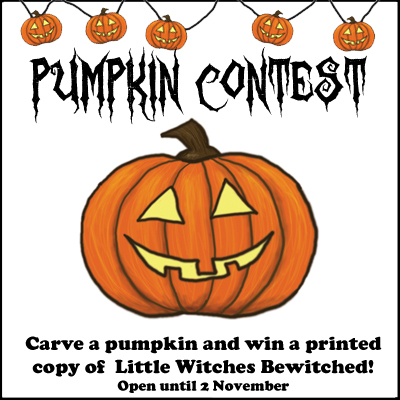 The prize is a print copy of Little Witches Bewitched (please note it won’t be sent until early December) signed to you or the person of your choice. The rules are similar to the other contests. The pumpkin must be your own work – although grown-ups can post on behalf of children. It doesn’t have to be new this year but the contest will stay open until 2 November 2013 to give you time to carve out a new one. 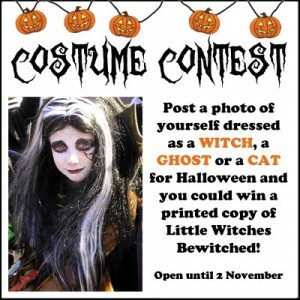 Don’t forget the costume contest and spell contest are still open and there’s everything to play for. Keep on partying, Halloweeners. The night’s still young. Enjoy Tim Curry singing the Halloween song. What’s your favourite Halloween music? Update 1 November 2013 All good things must come to an end and this is the end of the blog party. But the competitions are still open until midnight on 2 November 2013 so don’t forget to enter. Now I’m going to have to buy your book AND make pumpkin pie! Yes, do both! And send me some pie. Sara made pumpkin toaster pocket things the other day and they were nommy. Happy Halloween, witches big and little! We have a big pumpkin just waiting to be carved. Last year it was a scaredy cat… not sure what it’ll be this time round. I have even bought those little witches on Kindle! And not just because I am your mummy. I am bringing to this party my Thai pumpkin soup, with coconut milk and red Thai curry paste.It’s much less messy when consumed virtually. Also I am planning to make Halloween brownies tomorrow with two little witches and if you are lucky there will be some left by the evening. Just hearing about the pumpkin soup is making me hungry. Can you please post the recipe? I can certify its deliciousness for anyone who could possibly be in doubt. I am also looking forward to the Halloween brownies,I hope the witches leave me some. Mo, there’s a competition coming later today you should be sure to enter for! OK. It’s a Waitrose recipe card so I hope they’ll excuse this reproduction here (obviously if you make it you had better buy your ingredients from Waitrose!) I have paraphrased it a bit. • Stir in curry paste and pumpkin, stock and coconut milk. • Bring to boil then simmer for five minutes, then remove from heat and allow to cool. • Return to pan and heat gently, checking seasoning and adding more water or stock if wished. • Heat the cream and chopped basil in a pan and swirl into the individual soup bowls on top of the soup. Must buy pumpkin(s). But possibly wait until tomorrow if it saves me money. Realised last night there will be no pumpkin pie if I have no pumpkin to begin with. I brought some pumpkin bread, it should go excellently with the soup. Pumpkin bread! I didn’t know that was a thing, and now I must have some. I think I will take Becky’s advice and buy pumpkins as soon as Halloween is over and make all the things. Recipe for pumpkin bread, please? We can bob for apples – although Shadow says she’s not playing any game that involves water. Happy Halloween, Verity and Dulcie (and Rhiannon, of course)! I am in the land of Halloween, had some pumpkin pie at the weekend, and have been admiring all the Halloween decorations. A house I drove past had a full fake graveyard in their front garden, there are lots of pumpkins everywhere, and the friend I visited yesterday had a Halloween wreath on her front door. You would say it’s all very jolly! Apple and cider bread is also delicious. No recipes for pumpkin that I’ve actually tried myself, but here’s a photo of the best cat/tiger/Emily in the whole world ever! Happy Halloween and book launch! Time for a glass of something red – it’s grape juice, I swear… MUAHAHAHAAAAAAAAAAAAAAAA! Wait a sec – Jan Piénkowski illustrated Meg & Mog AND Joan Aikin’s books AND Haunted House… How have I never put that together before?! That’s, like, 20% of my childhood, right there. I still have my copy of Haunted House somewhere.